| Courtesy Mary O'Brien, op-ed mug. Maybe it&apos;s that my children and I twice spent spring vacations at Malheur National Wildlife Refuge in the early 1980s, when water was unusually plentiful and the birds at dawn were a cacophony. Or that we hiked near the refuge to see pre-dawn sage grouse males burbling like coffee percolators with inflated chests while the females feigned disinterest. And then, in 1983, there was the memorably titled book, "Sacred Cows at the Public Trough," written by former Malheur Wildlife Refuge naturalists Denzel and Nancy Ferguson. It was a ground-breaking book about, well, breaking of the ground. These many years later, we&apos;re still tied to Malheur&apos;s evocative, wide skies. Several months ago we arranged to stay with friends at the refuge this May. I&apos;m looking forward to the staff in the refuge headquarters telling us how the bird populations are doing. But after living in Oregon for 24 years and working 10 years on eastern Oregon public lands issues, including grazing, I moved to southeastern Utah. Here in southern Utah, 97 percent of the three national forests&apos; acreage is open to livestock grazing under 31-year-old forest plans. Last month, U.S. Reps. Rob Bishop and Jason Chaffetz handed Utahns and the nation their discussion draft of a Utah Public Lands Initiative (PLI), which would expand fossil fuel extraction, motorized recreation and compromised wilderness on national lands in eastern Utah. Not surprisingly, I guess, this "grand bargain" proposes to reward the Bundys of the West with the kind of frozen livestock grazing and lack of national authority for which the Bundys thought they had to pick up guns and occupy the Malheur Wildlife Refuge. The PLI would create a new kind of "un-wilderness," tying the hands of land managers. In the grand bargain&apos;s newly designated wilderness areas, National Conservation Areas, Special Management Areas and Recreation Zones, existing livestock numbers would be mandated to remain the same, or increase. In this new "wilderness," ranchers could use ATVs to place feed and bulldozers to build new infrastructure. The Forest Service would be barred from considering the continued existence, or disappearance, of species or species habitat when making grazing decisions. Sage grouse chicks scrawny from lack of bugs due to flowers having been grazed? Bighorn sheep dying from contact with domestic sheep? The alpine La Sal daisy exterminated from its only home in the world by exotic mountain goats? Colorado River cutthroat trout eggs smothered by sediment from raw, trampled creek banks? The public land managers would be prohibited from taking any of these into account. Before the gunmen occupied Malheur Wildlife Refuge in January 2016, did they know that there had been a successful collaboration between ranchers who graze cattle on the refuge, the U.S. Fish and Wildlife Service and environmentalists? As Colby Marshall, member of a ranching family that has long retained grazing permits on the refuge, reports on a recently finalized comprehensive conservation plan for the refuge, "Ultimately, at the end of the day, ranchers and environmentalists all agreed it was excellent. What it did is it provided flexibility for the public lands managers and the ranchers." Flexibility for public lands managers? Down in Cedar City promoting his grand bargain, Bishop crowed, "That&apos;s why in [my bill] I stripped out anything that allowed the agencies to have any discretion. If there was anything in there we took it out. That&apos;s the only way to give the people any kind of control." What people? Did Rep. Bishop know that in the last seven years in Utah, four long-term grazing collaborations made up of people  including grazing permittees, state and county grazing agency representatives, range professors, conservation and wildlife groups and county commissioners  have reached consensus (that means everybody agrees) on how to make sure livestock grazing and wildlife species and aspen and science are able to coexist? And that two more such collaborations are underway in Utah? That&apos;s not a reasonable take on the meaning of "the people"? Nothing, as we are learning with climate change, can be frozen in time. Not permafrost, not national borders and not last century&apos;s livestock grazing practices. What we need now, more than ever, globally and locally, are disparate people leaving their guns behind and agreeing to figure out how we all can live together in this world, in this nation, on these public lands, in wilderness, in southeastern Oregon, and in eastern Utah. All the people, as well as all our relations living in these lands. 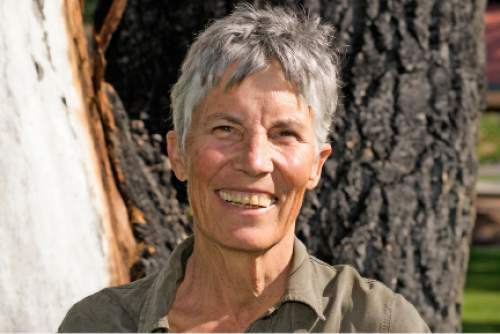 Mary O&apos;Brien is the Utah Forests program director for the Grand Canyon Trust. She lives in Castle Valley.